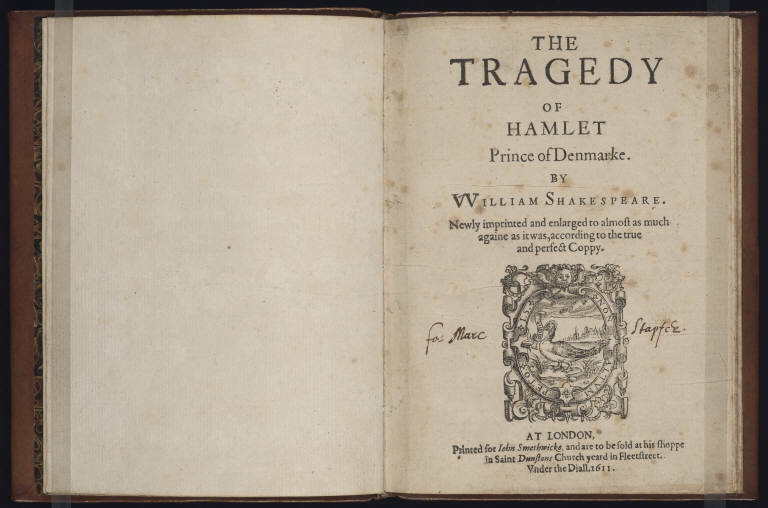 Shakespeare’s involvement with the third quarto of Hamlet, which was set to print in 1611, would take on a brief, fictional shot of life many years after its publication. Over the course of a few centuries, this copy of the third quarto made its way into the hands of Bulkeley Bandinel, who served as the head librarian of Oxford’s Bodleian Library for over forty years, from 1813 until 1860. With his death, a Sotheby’s cataloguer, entrusted with auctioning the more remarkable items Bandinel’s estate, took note of a curious dedication scrawled across the copy’s title page: “For Marc Stapfer,” it reads in legible secretary hand. Ecstatic at the sight of handwritten words on an early printed copy of Shakespeare’s tragedy, the cataloguer surmised that this was “in the hand of the poet!” The excitement proved to be unfounded, but it is a vivid consequence of the scarcity of materials written in Shakespeare’s own hand, and a testament to just how much we want there to be more.